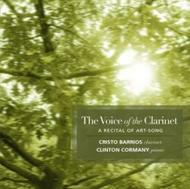 Presented here are a collection of transcriptions for clarinet and piano of classical song and lieder, many created by Clinton Cormany, and recorded here for the first time. Cristo Barrios was born on the island of Tenerife. He studied in Barcelona and the Royal Academy of Music in London. He has had numerous competition successes in Spain and Europe. As an active chamber musician Cristo has performed with many ensembles including the Brodsky String Quartet and others. His performances have been broadcast on Spanish National Radio (RNE), Radio Catalunya, the TV channel S4C and BBC Radio 3. Cristo has appeared as concerto soloist with many orchestras, including the Tenerife Symphony Orchestra, Barcelona Filharmonia Orchestra, Gon�al Comellas Chamber Orchestra, Andorra National Orchestra under the direction of Miquel Ortega, and the CSMC Youth Orchestra under the baton of Jordi Mora. Clinton Cormany was born in the USA. He has distinguished himself as an accompanist to many singers and instrumentalists in recitals all over the United States and Europe. Clinton�s concert work has included several large-scale projects involving his peers. With recital partners he has performed in Britain at the Oxford Lieder Festival, at St Martin-in-the-Fields, St John�s Smith Square, Fairfield Halls and Wigmore Hall. His performances have been broadcast by Spanish National Radio, BBC Radio 3, and American PBS. Recital work has taken him to Sweden and Austria, and he has made several extended tours of Spain with the clarinettist Cristo Barrios.